Chuck Bartowski no longer possesses the Intersect, but has still matured into a confident and capable secret agent. As he mentors the new Intersect, he also has to deal with the fact he and his team are now independent contractors with bills to pay and rival companies to compete with. When, yet again, a dangerous agent comes after the Intersect, Chuck has to call upon his resources and training to stop them. Chuck has always been a curious show, a geek comedy with dramatic and romantic overtones whose tone has often spun on a dime. The show has always done a good job of managing these different tones and styles, keeping everything grounded though Zachary Levi's earnest-but-sympathetic performance as the title character. In the fifth season, the show experiences several additional such tonal shifts, as Chuck is betrayed by his best friend (but it turns out not to be his fault) and, most surprisingly, has his life almost ruined in the final few episodes of the series. For a show that's always been quite warm-hearted and entertainingly cheesy, the surprisingly bleak tone of the final few episodes comes as a bit of a shock. The season - renewed purely to be wrapped up - only consists of thirteen episodes and it appears there may have been budgetary restrictions in place: our previous season villains were played by well-known actors such as Chevy Chase and Timothy Dalton. This year we get Angus Macfadyen, a very solid Scottish actor best-known for his supporting role in Braveheart (as Robert the Bruce). He does a good job, but lacks the geek-cred his predecessors brought with them. Even more problematic is the fact that he only appears in the last few episodes of the season with little build-up and his character is never really explored in much depth (in contrast to Dalton's hammy-but-complex Volkoff). The truncated run causes issues throughout the season. Storylines that would have been given whole episodes to develop in the second through fourth seasons are here disposed off way too quickly. An entertaining on-going subplot involving Carrie-Ann Moss as a rival contractor (and potential romantic interest for Casey) has enormous potential, but kind of peters out with no real climax or pay-off. Most frustratingly, there is relatively very little action in the Buy More. Big Mike, Lester and Jeff barely get any lines in some episodes, although a late-season subplot that sees Lester and a reformed and sober Jeff finally discovering what's going under their feet does help reduce this problem a little. Most surprising is a divisive late-season storyline involving amnesia. Given the tone of the show, I was confidently expecting some last-minute solution or cure would be found. Instead, we get a highly inconclusive ending. It's not quite The Sopranos, but the series ending without ever answering the central question poised by the last couple of episodes is an unexpected and possibly even brave choice. Whether it's the right choice is one that fans will be arguing about for years to come (or unless the much-rumoured Chuck movie gets off the ground). For myself, Chuck has always been first and foremost an escapist and fun show, not a gritty drama like the new BSG or something from HBO. Ending the show in this manner feels out of character for the series, and a little bit of pointless torture for our main characters who really deserved more of a happy ending. 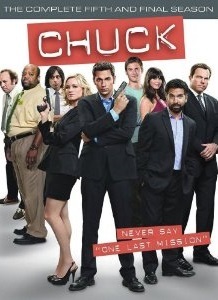 That aside, the final season of Chuck (***½) is entertaining, well-acted and often quite funny. The shortened episode order means some storylines aren't developed very well, and the ending will be divisive, but certainly the season is worth watching for established fans. In particular, the way Chuck's character develops across the five seasons, going from nerd to an intelligent, resourceful agent (exemplified by the shots of Chuck on the DVD spines, which cleverly show this development) does pay off very well here. The season is available now in the UK (DVD) and USA (DVD, Blu-Ray). The ending of the show, yeah, definitely was not what I was expecting. While there have been tones and shifts throughout the series, I was expecting some sort of HEA and surprised as hell when I didn't get it.